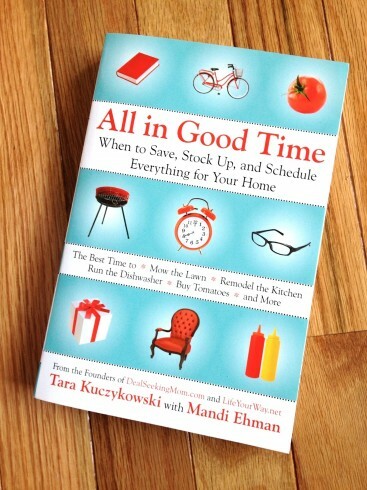 All in Good Time — On Shelves Tomorrow | Win 1 of 10 Copies!!! Maybe you’ve noticed the video trailer in the sidebar, but if not, I’ve got some BIG news… Mandi of LifeYourWay.net and I were hard at work in 2011 combining our expertise to write a book that you’ll be able to find on shelves tomorrow, Tuesday, January 3rd, 2012!!! Now writing a book has never been a goal of mine, but when the opportunity basically fell into my lap, I just knew that Mandi would be the perfect partner to help pull it all together. All in Good Time: When to Save, Stock Up, and Schedule Everything for Your Home is the product of countless hours of research and writing all spent to bring you the best tips for saving money and time that we could scrounge up. It’s so exciting to actually be able to hold the results off all of our hard work in my hand. But more importantly, I’d just like to take a moment to thank you, my reader, because without you none of this would have been possible! Pre-order the book from Amazon or Barnes and Noble, or find a local bookstore through IndieBound.org. Like All in Good Time on Amazon by clicking the like button right below the title. Tell your friends about the book. Click here to share it on Facebook. Like the trailer on YouTube. Or share it on Facebook. Like All in Good Time on Facebook. Today I’m giving away TEN copies of All in Good Time! To enter, simply pick one of the things from the list above to do and then leave a comment telling me which one you’ve done. Want an extra entry? Do as many of the things as you’d like; just be sure to leave a separate comment for each! By the way, if you’re a blogger interested in receiving a review copy of All in Good Time, I’d love to pass your information on to my publisher. Contact me here with your preferred email address! This giveaway ends at 11:59pm EST on Wednesday, 1/4/12, and is open to all U.S. residents 18 years or older. I’ll use And the Winner Is to select the winning comment. Winner will be notified by email and listed on my Giveaway Winners page. Winners must respond within 48 hours of notification to claim their prize. Good luck! Previous Post: « Monday Mail-In Rebates: Arm & Hammer, Feline Pine + More! I liked the trailer and on Amazon! Sounds like an awesome book! I love to find more ways to save money! I liked it on YouTube, Liked it on Facebook, Liked it on Amazon & Shared it on Facebook! I liked it on Amazon, liked it on YouTube, liked it on Facebook and shared it on Facebook! I liked your book on Amazon! I like your book on Facebook! I shared about your book on Facebook! I like’d All In Good Time on fb! I like’d All In Good Time on Amazon! I like’d All In Good Time on youtube! I like All in Good time on Facebook! I like the book on Amazon. I like the book on facebook. I liked this on Amazon. I liked the Youtube trailer. I shared w/ friends on facebook. I liked it on facebook, can’t wait to read it. Got a little over excited. I liked the video and posted on my facebook. Liked on You Tube. Already asked our local Library to order this book! I liked and shared on Facebook and liked on amazon.